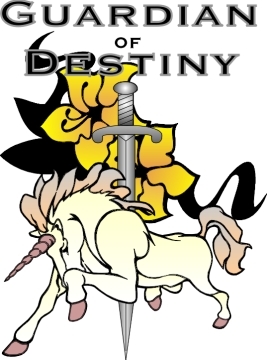 The Guardian of Destiny is a book I am writing which is outside of the Dukarian Legacy series. I have written 1/5th of the book so far. But it has been on a shelf for some time. I want to write it, but I just don’t have the time. My focus has been on running websites for my other love – dogs. And recently my focus has been on getting the Dukarian Legacy edited then published. It may be some time before you see the Guardian of Destiny, but here is a short synopsis. In the midst of a battle at the Black Wall, two children are kidnapped. The children escape with the help of an Emerald Falcon Knight. But now they must flee for their lives from the Great Lord Dorovan. Dorovan is a deposed god who struggles against his human restraints to take back his godship and rule all the lands. Despite his humanism, he still has great powers. But are these powers great enough to capture the child who holds his destiny in the balance? Only the Guardian of Destiny can save this child and her sister. But Galavan is just a humble knight with limited magical talents. And he is honor bound to the Knighthood. Will he abandon his duties to save what he believes are just mere children? And if so, will he be able to outwit a god? Flee across Sendovia with Galavan, the two children, and a disillusioned priestess. Fight against the wrath of a god and his evil minions. Join forces with magical creatures and watch as destiny is fulfilled. A mythical story of the Wolf and Sky, inspired by Native American legends. In a time long ago when the earth was new and the land was still dark, a mysterious shadow lurked in the mountainous woodlands. He was all alone, an enigmatic creature searching for his place in the world. The land was cool but his coat was thick. His snout was long and his nose sensitive to the fresh clean scent of the forest. His ears were tall and pointed, enabling him to hear the wind whispering through the trees. But no other sounds came to him as he prowled the night. His golden-yellow eyes were still useless in this very dark world for there was no light to see by. He called himself Wolf, though how he came by this name he knew not. No mother or father brought him into this world. He simply came into being. He was all alone as he traveled over desolate mountains and across cold icy rivers. As the eternal night wore on and on, he searched in hope for other beasts. When Wolf came upon the tallest and oldest mountain, he asked Mountain if it had seen any other creatures pass its way. But Mountain remained silent. So Wolf asked Wind, but Wind spoke too softly for Wolf to hear. Wolf continued his journey until one long and lonely night he came upon River. Wolf asked River if any beasts ever drank from its waters, but River sang in words that Wolf did not understand. Wolf even asked Tree and Stone, but none could give him the answer he sought. When Wolf emerged from the forest, he found himself upon a tall precipice overlooking the land. But the land was just as empty as the forest had been. Wolf sat down in despondency and hung his head down low. A hollow sadness crept over him. Loneliness began to crush his spirited soul. With a swell of emotion, Wolf looked up into the dark barren sky and began to sing a slow and mournful song. So moving was this song that Sky began to wake from its long empty sleep. As Wolf sang of his desire for companionship, Sky became overwhelmed with pity. It shared the solitude of Wolf but knew not what to do. So with the same heartbreaking sentiments, Sky began to weep. Then something miraculous began to take place. An eternal and infinite entity such as Sky does not cry ordinary tears. Its tears are full of magic. As its tears fell, some turned into points of light in the sky and some settled onto the land, igniting into a spark of life. Slowly, the song of Wolf grew to its climax. And in the final moment of anguish, Sky released one last giant tear. This tear became the moon. The moon was so bright that Wolf ended his song in wonder. With the help of the moon, Wolf’s golden-yellow eyes were finally able to penetrate the darkness. And what he saw was even more amazing than the sight of the moon. Wolf was no longer alone. The sparks of life given by Sky had become other creatures. All around him were other wolves who began to sing their songs of joy. Wolf grinned with delight as one by one his brothers greeted him. No longer was Wolf alone. His heart filled with delight as he and his brothers sang, danced, and played. Sky, too, realized that it was no longer alone. The stars and moon became its companions and together they watched the celebrations of the wolf pack. With a happiness of its own, Sky also began to dance. The magic of its dance created another magical entity. Waves of color ignited in the wake of Sky’s dance. Today we call this dance of light Aurora. So if you ever travel to the north where half the year is shrouded in darkness, just remember the myth of Wolf and Sky and how their sadness eventually turned into joy. Gaze upon the moon and stars and listen to the wolves sing them their praises. And watch Aurora with gladness as she dances to the Song of the North. “Song of the North” is copyrighted by D.R. Ross, 2008. Wolves are highly social animals who generally live in complex family units dominated by an alpha male and female. Wolves are known to survive in just about every climate except jungle and desert. Wolves can travel alone or in packs. Packs can range anywhere from 3 to 30 wolves. Wolves are excellent long-distant hunters. They can follow prey all day and night if necessary. The howling of wolves is thought to proclaim territories to other packs or to communicate to those within the same pack. Lone wolves do not howl. The strong jaws of a wolf are able to bite through bones. People are in more danger with dogs than with wolves. If I am going to sell my books as ebooks, then I need to convert the word document into PDF and/or HTML formats. I have no clue how to do this. My understanding is that I can use Adobe PageMaker or Adobe InDesign. Supposedly, I can also just use word to convert to HTML. It won’t be easy because you can’t simply save as HTML or PDF. There is a lot of modifying and editing which needs to be done. So my next step in getting my book published is to learn how to use the conversion programs and slowly convert my books to both PDF and HTML. Here is a website I found which looks promising – http://kindleformatting.com/formatting.php. Since finding time is a major factor, this could take me several months. I could pay someone to do it, but how do I know which website to trust? I’d rather take the time to learn to do it myself. I will keep you posted and let you know which program I end up using. I am reading “Start Your Own Self-Publishing Business” and finding that I still have a long hard road ahead of me before I can sell my books. One of the things this book talks about is the need for me to have front and back matter. What is front and back matter? It is the stuff in the book which is not part of the story but essential to the book itself. Half Title Page – Includes book title and subtitle only. Title Page – includes book title, subtitle, author, publisher, and more. Copyright Page – includes copyright, all rights reserved statement, ISBN, and more. Book Blurbs – quotes from those who read the book – preferable someone well-known. I do not yet have any book blurbs. Map – As with most fantasy novels, a map is essential when writing about a fictional place. All back matter for a fiction book is optional. I may have an appendix for people and place descriptions. I may also have an About the Author section. I may add an order form on the back so that people know how they can order more of my books. And I will probably have a short synopsis of the book on the back cover. Life has taken its toll. A man with no name mourns his own tortured soul. He wants to end his pain, but has no control. Is why his body bleeds. And live the life of the wretched and obscure. Then his agony is soothed by something dark and pure. With his heart’s mind, he grasps for the lure. And the eyes of death appear. The man realizes he has nothing to fear. He knows it will make all his pain disappear. As the darkness embraces him. His body calms. He closes his eyes and lowers his head. His pain ends… It’s forever gone… ETERNALLY DEAD. The notes I have taken in the research for writing my books could almost be a book in itself. I had to make rules for magic, study arms and armor, design the setting, name the people and places, establish cultures, understand architectural names, and so on. My favorite study topic was of different cultures. I love ancient history so coming up with a main culture and different sub-cultures for my book was fun. Ungal is a country and the place for the main setting. It has basically a medieval culture. Most people in Ungal are fair-skinned, but even that can vary because Ungal has been settled by various other peoples. Because of this mixture, Ungalan people can be tall or short, have dark hair or light, have straight or wavy hair. Poor soldiers wore quilted armor, middle class might wear leather armor, while the very rich wear chain mail or even plate armor. Helmets are common and these too varied. Depending on which part of Ungal, the helmet of a nobleman might be crested or plumed, conical or plain, with or without nasal guards, etc. Most Ungalan soldiers carry a sword, but spears, forks, pikes, ax, long bows, etc. are also prevailant. Most men have beards, generally short but sometimes long. Noble women wear makeup with the women of Berdoa and Mael wearing the most extreme. Women also wear jewelry. How much and what kind of jewelry depend on which region of Ungal. You will never see the word “pants” or “shirt” in my book (unless it is a linen undershirt). Men ear leggings and tunics. Sometimes they wear a leather jerkin or vest. Soldiers might wear a surcoat. Women wear long dresses of varying styles. Most place and people names are English-sounding. Menkhara is based on Egyptian cultures. Tomis’ mother is from Menkhara. And as such, she has black wavy hair, is darker-skinned, and has brown eyes. The word Menkhara is derived from Egyptian-sounding words such as Sekhmet, Nefertari, Khepri, etc. Most people of Menkhara are tall and lean. Men do not grow much facial hair. Men and women wear light clothing due to the heat. Women wear Khol around their eyes and lots and lots of jewelry. Men do generally wear much armor as it is too hot. They prefer hand-to-hand combat but also carry swords, daggers, and use a shield to protect them in battle. The Azizi people are similar to Native Americans in many aspects – perhaps a little of both North and South Native Americans. Tattooing is prominent in their culture. They are slightly bearded and have medium-toned skinn. Their hair is long, dark, and generally matted and weaved with feathers, beads, and/or bones. Their weapons of choice are spears, daggers, and primitive bows and arrows. The Miyashi are the original inhabitants of Ungal. But they have long since gone into hiding and are believed to be extinct or genetically diluted into the population. The Miyashi are thin small-boned people with blue or green eyes and strawberry-blond to red, to dark red or auburn hair. Women usually wear their hair long and braided for ceremonies. Men generally keep their hair and beards short until they get older. They are bronze-skinned which is very unlike our culture where most red-headed people are fair-skinned. The Miyashi purposely has an oriental sound to it, but the culture is not oriental based. The Miyashi are magic people. To find them in Ungal will probably be your death because they do not want to be found. The culture of the Outlanders will much represent the Norsemen. There will be a few differences, but not much. The Outlanders have much facial hair – chin beard, mustache, and bushy eyebrows. They keep their cheeks shaved. Sometimes the mustache or beard is long enough to braid. Their hair might be braided (or plaited) as well. They have yellow cat-like eyes, a large square upper face, and narrow chins. Like the Norsemen, they love battle and glory. They sometimes use big heavy swords in battle, but more commonly, they use a double-ax or pole-ax. The warriors wear firs and hides as clothing, with big tall furred boots. The only metal armor they wear are the horned helmets. For protection in battle, they carry big heavy shields. Tethra is not mentioned too much in books 1, 2, and 3. But I have big plans for it by the 5th book. Tethrans will be more oriental in culture. Their swords will be single-edged and Samauri-type. Their armor, too, will resemble Samauri armor. A big difference, however, is that they will be generally light-skinned and the men will have beards. Find a Literary Agent or Self-Publish my Books? Three books of the Dukarian Legacy are written, but none are published. There is nothing available to read on line yet. There is no paper version to order. So what’s next? Publish it, of course. But it’s not as easy as it sounds. How do I publish it? Do I pursue a literary agent again? Do I try submitting directly to publishers such as Tor (as suggested by one of my blog followers)? Do I self-publish online? By having a literary agent represent me, I save a lot of work and can focus on writing more books. I have many more stories in my head – The Guardian of Destiny, Hunt of the Darkblood, and at least nine more idea sequals to the Dukarian Legacy. A literary agent will work on getting the publisher who will then work on the promotion of my books. I won’t have to read up on self-publishing or marketing. I won’t have to worry about the technical side of the book such as ISBN numbers, the book cover illustration, and so on. Lesson learned – do not pay a literary agent up front. What else do I not know? What other hard lessons are there for me to learn? Literary agents and publishers also get a big cut. That can be worthwhile if I don’t have to deal to much with the technical issues and marketing. The biggest disadvantage of a literary agent, however, is finding a good literary agent to begin with. I’m sure there are a lot of good ones out there but competition is stiff. I am not the only person out there who has written a book that they want to get published. I could have the best synopsis and my first three book chapters could be flawless. But agents and publishers have to look through hundreds of them. They may not even look at most manuscripts because perhaps they are not interested in my particular genre at that particular moment in time. Then, what if I do get an agent and a publisher for my book? They may want to make changes. They know best about what will sell but do I really want to change the story to fit the masses? I can have 100% complete control over all aspects of my book. I can design my own cover, keep the story just the way I like it, and keep all my own profits. I have to admit that this has great appeal. I am an artist so I can work on designing my own cover. If that doesn’t work, I can save up to hire a graphic artist. And I am already familiar with online marketing and social networking. Also, since there is no guarantee that I will even find a literary agent or publisher, self-publishing guarantees that I get my books published. What good are they doing right now sitting on my shelf? Self-publishing sounds really good until I consider all the aspects that have to go into self-publishing. Do I self-publish online? Do I build a website to sell my book or sell through e-publishers? Do I get a paperbook published from sites such as Lulu.com? If I do paperbooks, I have to worry about storage and finding distributors. Building a website and online marketing may be easy for me but other aspects of marketing such as getting trade reviews, news releases, book fairs, etc. All this will cost money up front. And if I fall short in my marketing, I could stand to lose money instead of make money. It doesn’t just cost money, it also takes time. Finding the time is really difficult. Can I do both? Can I market my book online in PDF format while also looking for a literary agent or publisher? Some sources say no while other say yes. I’ve heard that some publishers prefer you have a fan base before they take the risk of publishing. But I’ve also heard that others don’t want any version of your book out because they want all sales to go through them. The world of publishing books is changing dramatically with the Internet. Can I self-promote an e-book, then remove it for sale if I find a publisher?